In May 2013, Hashimoto Toru,1 the Mayor of Osaka, Japan, and the co-leader of the Nationalist Japan Restoration Party, caused an outcry from some international communities, particularly those of feminists, by commenting that the ‘comfort women’ system during the Second World War was ‘necessary’. Hashimoto was fiercely criticized, not only by feminists but also by the media, the wider public in Japan and even by some conservative Japanese politicians. 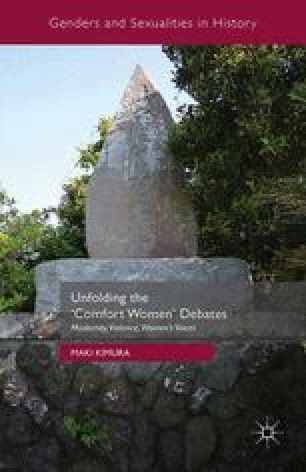 However, this incident exemplifies how the dominant political climate in Japan surrounding war atrocities during the Second World War, including the ‘comfort women’ system, has, particularly over the past decade, turned nationalist and reactionary in a way that deeply disturbs feminists and left activists. This tendency has worsened since Abe Shinzo became Japanese Prime Minister for the second time in December 2012. He attempted to withdraw the Kono Statement of 1993, which acknowledged the involvement of Japanese authorities in organizing the ‘comfort women’ system,2 and to review the pacifist constitution so that Japan can use force to participate in settling international conflicts.